Posted in A WORLD OF DIFFERENCE Institute, Anti-Bias, Education, Other Blogs. 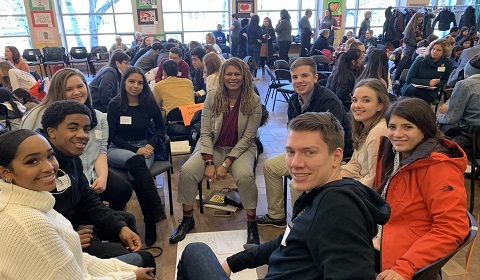 Nearly 300 students and educators from 30 schools from across the greater capital district attended the STOP Conference at Siena College on January 11th 2019. The STOP conference is held in remembrance of Dr. Martin Luther King, Jr. and provides a platform for middle and high school students to engage in anti-bias education and skill building. During the morning breakout sessions, students had an opportunity to hear from students from different schools throughout the region on their experiences with bias, privilege and identity. These small group activities allowed students from vastly different backgrounds to come together and learn from each other. In the afternoon students were given a chance to rejoin their school groups and brainstorm ways they could use the privileges they possess to lift up marginalized groups. These schools shared their ideas with one another and developed plans to build a more inclusive and respectful community. This was the fifteenth annual conference in partnership with Siena College, and we are very proud that this day continues to be a resource for local schools in combating bias and prejudice in memory of Dr. King.